Coloriasto: Photo-Trichromatic Printing. Part I. Chromatics. Colour has no material existence; it is a sensation caused by the excitation of the nerves of the retina of the eyes. According to the Undulatory Theory of hght, the molecules of luminous bodies are supposed to be in a state of exceedingly rapid vibration and to communicate these vibrations to the ether, that highly rarefied substance, which is said not only to pervade all space, but also to surround the molecules of all matter. These vibrations or waves of the ether are exceedingly rapid and minute, the wave-length varying with different coloured lights. The length of the rays which excite the sensation of red, is about 1/39000 of inch, whilst the length of the rays which excite the sensation of violet is about 1/59500 inch. Orange, yellow, green and blue are of intermediate lengths between the two. The velocity of light is 186,772 miles per second. To obtain an idea of the principle of the wave motion of light in the shape of a homely illustration, take a rope, perhaps ten feet long or longer, tie a number of knots in it and fasten one end to the knob of a door. Hold the other end in your hand and give it a rapid up and down motion. A wave-like motion will run from your hand along the rope to the door knob and the knots will move transversely to the direction of the vibration, but will practically maintain constant distances relative to one another, or to any fixed points such as your hand or the door knob. Another way of illustrating the wave-like motion of light is to fill a basin with water and strew it with a little sawdust. When the water and sawdust are perfectly still, drop a pebble or some other heavy body into the water. You will notice that concentric rings or waves spread or run from the place where you dropped the body in. This wave-like up and down motion of the water will be communicated to the floating particles of sawdust, which here serve to mark the positions of the particles of water. These particles, when the agitation has passed, will have come to rest in precisely the same places where they were before. They will neither travel nearer the edge of the water nor nearer the place where the pebble was dropped in. The rapidly vibrating molecules of an incandescent body set up corresponding vibrations of the ether, and these wave-like movements spread in all directions, or as scientists call it, in concentric spheres. The particles of the ether move transversely to the path of the light as we have seen in the movements of the knots in the rope or the floating sawdust agitated by the water. 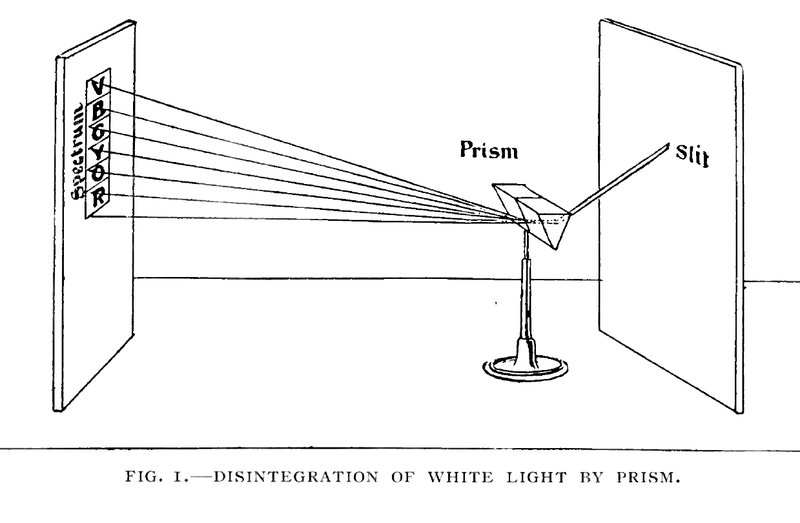 If a ray of sunlight be permitted to pass through a small hole (or better, a narrow slit) in the shutter of a darkened room, and to pass through a prism—a triangular piece of glass—held in the beam, the ray of light will be spread out or dispersed, and on the opposite wall of the room a band of colours, as in the rainbow, will appear. These colours in their order are red, orange, yellow, green, blue, and violet, and they are called the colours of the spectrum. Sir Isaac Newton named the dark portion of the blue, where it merges into violet, "indigo," thus counting seven colours—the reason why we often hear or speak of "the seven colours of the rainbow." This experiment teaches us that white light is made up of many coloured rays, into which it can be disintegrated. Colour, therefore, may be taken to be a part of disintegrated white light. We shall see further on that coloured rays may be united again to form white light. A darkened room and a slit in its shutter is a very cumbersome arrangement, and useless for the exact scientific analysis of light. For this purpose an optical instrument, called a spectroscope, has been devised. A large laboratory spectroscope usually consists of three movable tubes, arranged at angular distances of about 120° (or the third of a circle) from one another: in the centre of the circle is placed the prism. The collimating tube allows light to enter through a narrow adjustable slit and pass through a lens called the collimator, which causes the rays of light to fall parallel upon one or more prisms. These prisms bend or refract the light and break it up into its component parts or colours, which can be viewed through another tube, which is really nothing but a modified telescope. 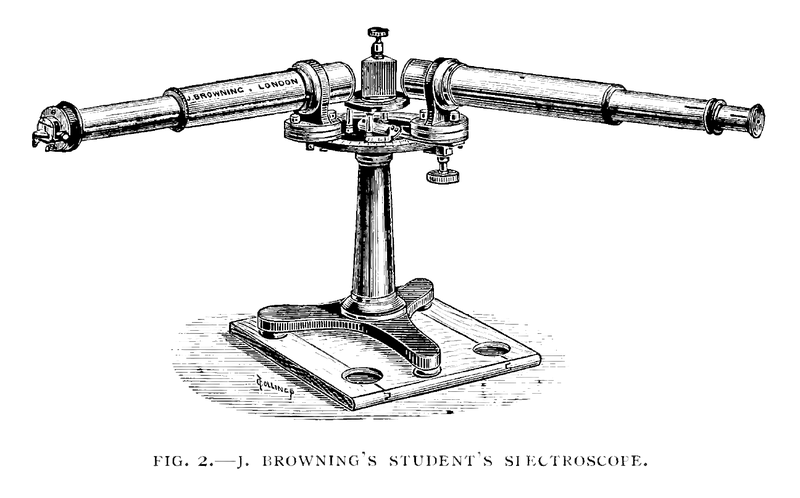 The best spectroscopes have yet a third tube, containing an engraved or a photographic scale, which can be seen through the observing telescope, simultaneously with the spectrum — a contrivance most helpful in spectrum analysis. Spectroscopes vary in their arrangements, but the principle upon which they are constructed is the same. A smaller and more convenient form of spectroscope is called a direct vision or pocket spectroscope, and contains slit, collimating lens, prisms and telescope all in one tube, which can be drawn out for focussing purposes. If we view the spectrum of sunlight or the "solar spectrum," as it is called, we see a number of gaps or dark lines across the band of colours. These lines will always be found in the same position relative to the colours and alwa3's at the same relative distance from each other, and are, therefore, used as convenient landmarks. They were first described by the famous physicist, Dr. Wollaston, in t8o2. Fraunhofer minutely investigated and mapped them out in 1814, and they have ever since been called after him, Fraunhofer's lines. The principal lines are denoted by ten letters:—A, a, B, C, D, E, b, F, G, H. A and a are in the dark red end of the spectrum, B and C in the red, D in the orange-red, E and b close together in the green, F in the blue, G in the blue violet, and H at the violet end of the spectrum. Only the solar spectrum shows these Fraunhofer lines, which are due to the absorption of some wave lengths of light by gases in the sun's envelope. Electric, lime and gas-light, and all luminous solid and liquid bodies, give continuous bands of colours or spectra. Glowing vapours and gases do not show continuous spectra, but only bright lines on a dark background. These lines are different and characteristic for different substances, bemg always exactly the same for each chemical element. They have been carefully observed and mapped out, and form the basis of what is called " spectrum analysis." If light emitted by an incandescent body passes through a gas, a negative spectrum will result. The spectrum will then show dark lines in precisely the same places where the bright lines would appear on a dark ground, if that particular gas were itself in a state of incandescence. If a piece of ruby glass is held in front of the slit of the spectroscope, all the colours of the spectrum disappear, except the red and orange. This effect shows that the ruby glass stops or absorbs the violet, blue and green rays of white light, and transmits only part of the yellow or orange and the red rays. If a green glass be taken instead of the ruby one, it will be found that the red and orange on one side and the blue and violet on the other side of the spectrum are blotted out or absorbed. The remaining part, which is green in this case, is called an absorption spectrum. When a ray of light strikes a solid body, it is supposed to penetrate through a minute distance, and to leave again at an angle similar to that described by a billiard ball striking the cushion and rebounding. This angle is called the reflecting angle, and is subject to fixed laws, the laws of reflection, which, however, cannot be defined here. It may, however, be briefly stated that a polished surface, such as a plane mirror, reflects the light regularly, keeping the rays closely together or parallel, whilst rough surfaces, such as snow or white paper, scatter the light in all directions. If white light illumines a body and all of it is again reflected, the body will appear white. If all the light is absorbed, the body will appear black. Snow reflects all the white light and therefore appears white; black velvet absorbs all and appears a perfect black. A sea fog, which diffuses all .the white light, will probably form the purest white in nature. If part of the coloured rays constituting white hght are absorbed and part are reflected, the body will appear coloured. The colour of the body is determined by those constituents of the white light, which being reflected, enter our eyes and excite certain changes in the "end-organs" of the retina. The remaining constituents of white light are retained or extinguished by the body. A red poppy will retain some constituents of white light, namely, violet, green and yellow, while it will reflect orange and red, which two reflected colours will give the poppy its characteristic scarlet appearance. A bunch of violets will absorb all the rays of white light except blue and violet. The colour of a body will be modified by the kind of light to which it is exposed. Let a poppy be exposed to light passing through a green glass, and it will appear black. This is caused by the red and yellow rays, which the poppy reflects under ordinary circumstances, being stopped by the green glass, whilst the poppy does not possess the property of reflecting the green which the glass transmits. No light at all will, therefore, be reflected from the poppy, nor excite our optic nerves under these peculiar circumstances, and the result is blackness. A printer viewing a pale yellow print through a blue glass will, from the same cause, see the yellow print as if it were printed in black. Gas-light, which is deficient in violet rays, will modify most colours, particularly violet.